How a Computer saved the world !! @ History Correction Alert !! Believe it or not ! ENIAC was NOT the 1st Programmable Electronic Computer!! COLOSSUS WAS !! ... AND IT MAY HAVE SAVED THE FREE WORLD !! 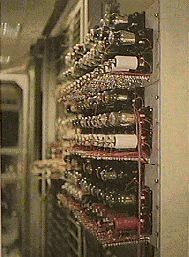 While working as a lowly engineer at the British Telephone Establishment, Tommy Flowers came up with the idea to use paper tape and 'programmable switches' made of thermion valves (Vacuum Tubes) to create a programmable device to automate the switching of telephone calls. 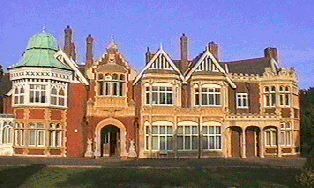 While he was unable to entirely automate the British Telephone Establishment with it, in 1941, with Germany sinking American ships bearing supplies to England, badly needed, Tommy convinced the famous Code Breakers at Bletchley Park Mansion (Project Ultra) in England, to fund his effort to build a larger model, dubbed "Colossus", to help decode the Lorenz Ciphers that Germany was using with Teletypes, to send messages from Admiral Durnetz to his U-Boat Commanders roving the waters of the North Atlantic, so that Allied Convoys could steer clear of them. It took Tommy a mere six months to complete his machine, and he set about, with the help of the Mathematicians and Code Breakers of Bletchley Park, writing it's first programs to decrypt the German ciphers of the Lorenz machines late in 1942. 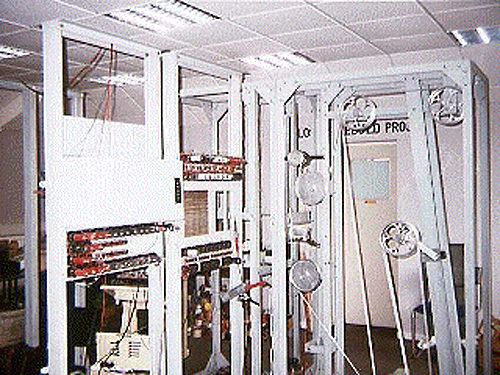 (U of Penn's Eckart and Mauckley's "Eniac" came online for the first time in 1946). By early 1943, Tommy Flower's Programmable Computing Machine was completed AND programmed, more Colossi were being built for more complex operations, and it was in operation decoding encrypted German radio-teletype messages by early 1944 at the top-secret location of Project Ultra: Bletchley Park (picture at right). That was just as the University of Pennsylvania and it's pioneers, Drs. Eckley and Mauckert, were first just STARTING to develop what later became known as ENIAC (which spells the biblical name "CAINE" backwards, and was finished in late 1945-46). Flower's Colossus was the world's first Programmable Electronic Computer. By the end of the war, 10 of the computers had been built for the British War Department, and they played an extremely significant role in the defeat of Nazi Germany, by virtually eliminating the ability of German Admiral Durnetz to sink American convoys, by undermining German General Irwin Rommel in Northern Africa, and by confusing the Nazis about exactly where the American Invasion at Normandy France, was actually going to take place. Because of their involvement with Bletchley Park, Colossus's capabilities were known to the United States War Department's Intelligence Arm, who after seeing Colossus start playing so crucial a role in military action against Germany in 1944, then sought to have Drs. Eckley and Mauckert at University of Pennsylvania adapt the concepts of Colossus's design to the building of the ENIAC, not to minimize the remarkable work of Eckley and Mauckert. Because the British had classified Colossus under the shield of England's Official Secrets Act, it's existence wasn't ever revealed to the public until Colossus was declassified late in the 1970's, long after the world INCORRECTLY gave credit for the programmable electronic computer's invention to the University of Pennsylvania, Eckley and Mauckert, ENIAC and later UNIVAC. A subsequent derivative British computer, called: AJAX, introduced features such as virtual memory, disk storage, and fast communications, that took decades to emerge in the public sector in the burgeoning American computer industry of the 60's. Dr. 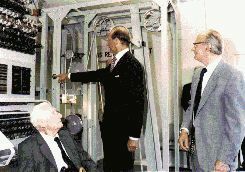 Flowers, a compassionate and humane man driven by the motive to save human lives, kept the secret right along with the British Telephone Establishment until long after declassification, speaking only briefly about his invention at a few public gatherings, and helping rebuild one, in the mid 1990's, prior to his death (a picture of Tommy Flowers to left). 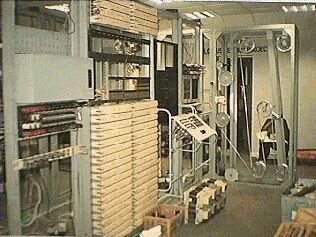 The British considered the secrets of Colossus so sensitive, that they did not even want the declassified machines examined by anyone, so in the early 1980's they destroyed all 10 Colossus Computers. Later on, in 1994, Tommy Flowers and a group of visionaries, reconstructed a Colossus exactly as it had been (using some of the parts from the first which had been secretly cached by admirers of Bletchley Park, see pictures left and below) from drawings and diagrams, and it now resides in the Bletchley Park Museum in England. We may very well owe our FREEDOM to it. WHAT WAS THE BIGGEST AUTOMATION TECHNOLOGY COMPANY IN AMERICA DOING?? Interestingly, at the time, IBM Corporation, a US company who has since risen to be the biggest commercial computer company in the world, was involved helping NAZI GERMANY during WWII. As revealed in a recent book by Edwin Black, IBM Corporation profited from sale of it's punch card, tab and sorting equipment and automation methods, which it sold surreptitiously to Nazi Germany through it's German subsidiary operation, earning Thomas J Watson the German equivalent to the Silver Star of Honor, which he proudly wore to business meetings, it being the equivalent of Adolf Hitler's "Congressional Medal of Honor". Watson had to be threatened by the War Department to get him to give the Silver Star back to HItler right at the peak of World War II IBM equipment was used, among other things, to encode messages, and IBM's system engineering staff taught the Nazi's how to operate the Gas Chambers and Ovens and other extermination equipment used in the German Death Camps more efficiently. Those Death Camps were used to murder millions of innocent Jews, Gypsies, Catholics and the Infirm, which the Nazi's leveraged so as to loot their victims' assets of money, property, and even the flesh off their bones (used as fertilizer and tested as a food substance for the troops) and the gold in their teeth, and the skin off their backs (used to make lampshades and moccasins), all of which were used to fuel the NAZI war machine. (Copyright (c) 2002, 2003, 2004 American Computer Science Association Inc. All rights reserved.